Softcover. Francis Thompson in 1888. He was an ex-medical student with a dissecting scalpel, and a history of mental illness and trouble with the police. He had just broken up with a prostitute and had written about cutting women's stomachs open. At the same time, a few yards from his refuge, a woman was knifed, as part of a spate of prostitute murders, which one coroner said was by someone who had considerable anatomical skill and knowledge. 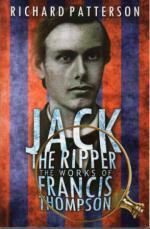 The author sets out a compelling case for English poet Francis Thompson as the prime suspect for Jack the Ripper. With Bibliog. 399pp. trade size softcover. As New.